My last post was a gallery of pics I took while attending the U.S. International Toy Fair at the Javits Center in Manhattan, NYC. I haven't had a chance to post here recently, since I just had an awesome weekend-long birthday bash! I've also had many good things going on in both my business & personal life that are the culmination of years of patience and persistent effort. Even though I posted a gallery of pics already, I wanted to now feature what was the highlight of the show, for me. 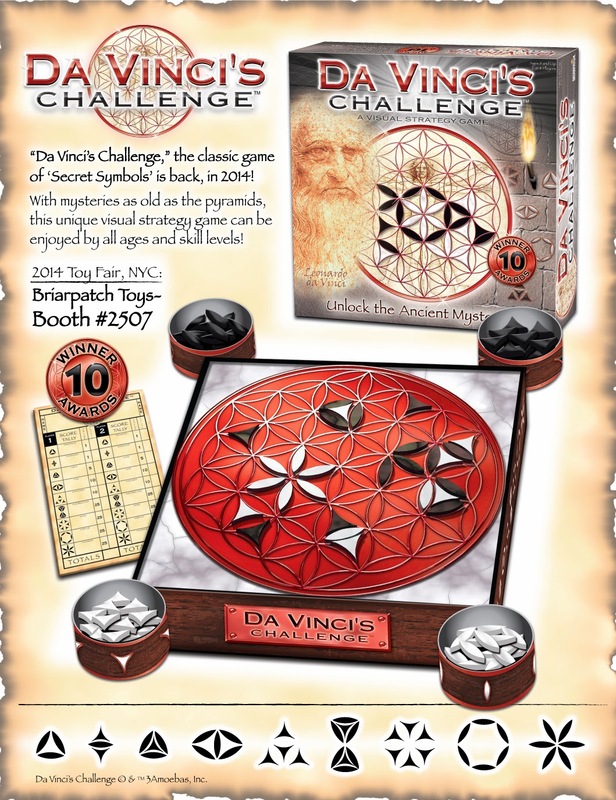 After a hiatus of several years, the game "Da Vinci's Challenge" made a return to Toy Fair this year! "Da Vinci's Challenge" is a visual strategy game, that I created as a graphic design student. One of my senior projects was to create an original board game. I found inspiration in the ancient symbol of interlocking circles, known as 'The Flower of Life'. The historic legacy of the design also made me use a classic theme for the look of the game. I hand-made the original version out of • carved stone pieces • a copper plate I etched for the game board • a stone block for the base • a wood case • & parchment paper for the rules. Once I decided to use the Flower of Life symbol as the basis for the game board, the idea for the game play & rules came quickly to me. There are 2 types of pieces, an oval & a triangle. Each player chooses their color & takes turns using their pieces to create 9 different patterns, or "Secret Symbols". The patterns are worth different point values, depending on their complexity. The player who scores the most points by the end of the game wins! The game play is easy enough for children to learn, but there are strategic elements that add to the depth & challenge for advanced players. You can block your opponent's patterns, & also create multiple patterns by placing a single piece. At the end of the game, the pieces covering the game board form a unique design every time. You can look at the finished board & see all the patterns that have made throughout the game. These are just some of the features that make "Da Vinci's Challenge" so unique. The publisher decided to produce a new run of the game this year, with several major improvements. The new edition is planned to have a molded plastic game board with slots for the pieces, and also cups to store the pieces. I have personally updated the package design & the graphics for a more polished look. These are all things that were sorely lacking in the first printing, and make a world of difference in the gaming experience. "Da Vinci's Challenge" is a creation that I believe is truly timeless. I hope that this gets to market again & reaches many people- to give them enjoyment, inspiration, and perhaps insight into the mysteries of sacred geometry & other esoteric wisdom. "Da Vinci's Challenge", at the Briarpatch booth. This past weekend, I went to NewYork City for the U.S. International Toy Fair. It is a trade show where many toy & game companies from around the world exhibit their latest products. The convention is held every February, at the Javits Center in Manhattan. I've been going to the Toy Fair every year for most of my career, since it is a chance to see many of our studio's clients & other people we deal with in the industry. It's also a place where we can see all the product & packaging design we do throughout the year, in one place. My last post was an announcement for the return of the strategy game I created, "Da Vinci's Challenge". I'll talk a little more about that in my next post. Back in my days as a college student, I created the award-winning visual strategy game, "Da Vinci's Challenge™." The game board is the beautiful circular symbol, known as 'The Flower of Life'- an eye-catching pattern of interlocking circles. This geometric design has been known to artists & thinkers throughout history. It was carved onto ancient Egyptian temples, & it was even studied in depth by the game's namesake, Leonardo da Vinci! Play is simple enough for anyone to learn- but offers endless strategy, to challenge the most dedicated gamers. Each player uses the shapes in their color (ovals & triangles), to create 'Secret Symbols'. These are configurations that resemble familiar icons- such as a Pyramid, Eye, Flower, and Star. Each 'Secret Symbol' has a point value that depends on the difficulty to complete it. The player who scores the most points by the end of the game wins, & becomes the Master of Da Vinci's Challenge! I originally created "Da Vinci's Challenge" for a senior project, when I was a graphic design major. The original version was hand-made from stone pieces, a copper board, & a wooden case. I eventually pitched it to a client who published board games. It was first released in 2005, and has won some of the top awards in the toy industry- including the Oppenheim Platinum Award & the Mensa Mind Games Select award. After a hiatus over the past few years, a brand-new edition of "Da Vinci's Challenge" is on track to make a comeback, in the Fall of this year. It will be featured this month at the 2014 Toy Fair in the Javitz Center, NYC, at Booth #2507 for Briarpatch Toys. 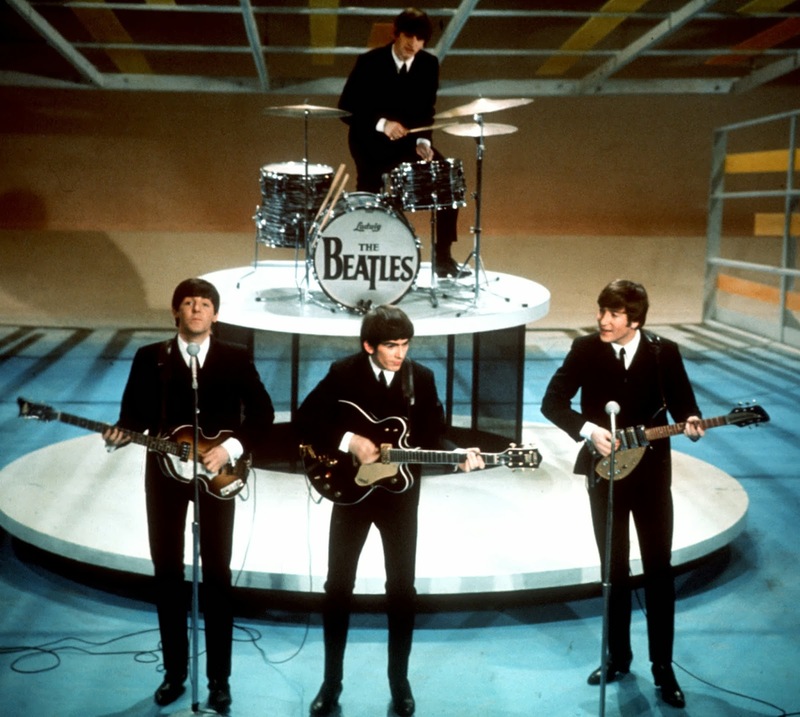 50 years ago, The Beatles came to America & performed on the Ed Sullivan Show on February 9, 1964. This was an event that truly made music history & has influenced people ever since, whether they know it or not. From an early age, my Dad, Big Paul, impressed upon me the greatness of The Beatles & their music. Half a century after he saw this live on TV, with so many millions of other people, I was with my Dad watching The Beatles Grammy special tonight. It was an excellent tribute to this legendary band. It's clear that this 1st appearance of The Fab Four in America defined the baby boomer generation, almost as much as the Moon landing or any other event. They not only changed the musical landscape of the time, but also had a huge effect on pop culture in general. They would go on, in their relatively short career, to break all kinds of ground in creative & technical artistry. Anyone with any music knowledge recognizes The Beatles as the greatest band of all time. Their impact on the world cannot be overstated, and their genius will be apparent for as long as their music endures. I'm going from the sublime... right into the absurd. I saw this completely crazy monkey video on BoingBoing, by the master of surreal animation- Cyriak Harris. I saw this interesting image on waterpeoplenotgrass.tumblr, a fusion of East & Western religious art. It uses the face & sacred heart of Jesus Christ combined with the iconography of Tibetan Buddhism, which includes the sacred lotus. 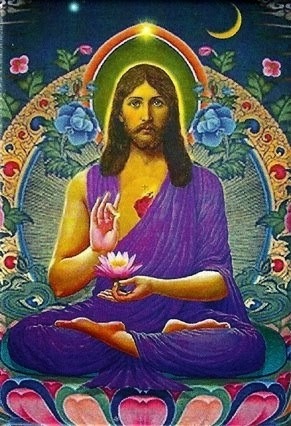 Siddartha Guatama (Buddha) supposedly lived about 500 years before Yeshua bin Yusuf (Jesus), and there is some speculation that Jesus was familiar with The Buddha's teachings. Both of these religious traditions embody the practice of enlightened spiritual values.